Off Grid Survival, Self-Sufficient Living, Non-Electric Heavy Duty Kitchen Mixer. 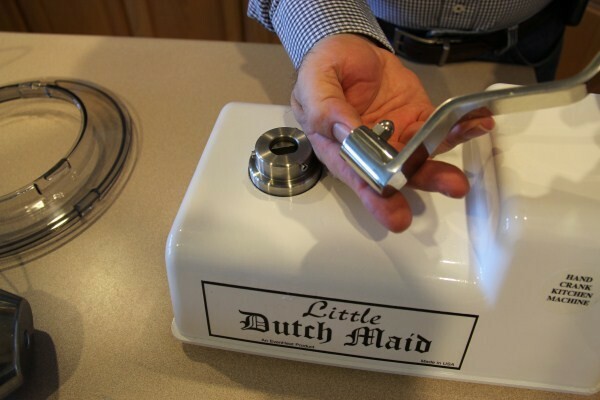 The Little Dutch Maid Hand Crank Kitchen Mixer, Our Most Popular Product. 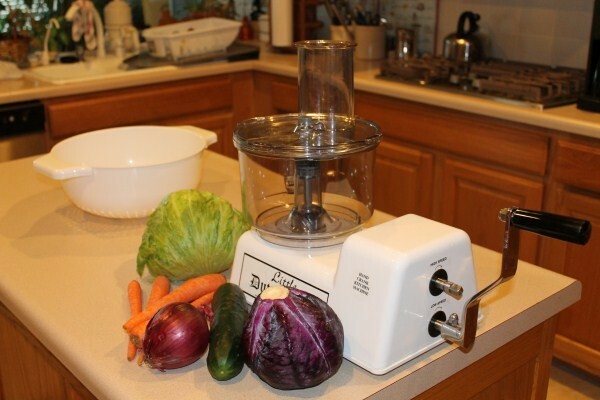 This is the ultimate multi-purpose food processor it uses no electricity. 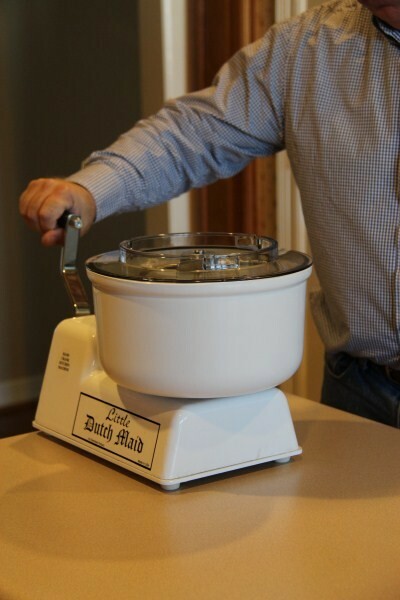 Originally designed by an Amish gentleman to stand up to the rigorous processing of large amounts of foods for large Amish families and gatherings, the Little Dutch Maid is built for commercial use. Components are German made; the same type of parts used in high-end commercial style machines. 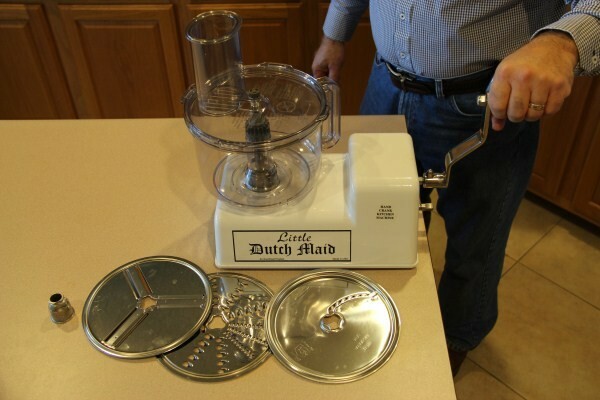 For those who want a simple off-grid hand crank mixer to make bread and mixes the standard Little Dutch Maid model as priced will be all that you will need. This is the unit that is purchased the most. It comes with the heavy hand crank base, the plastic mixing bowl, splash guard, lid and the metal driver with the whisk attachments. 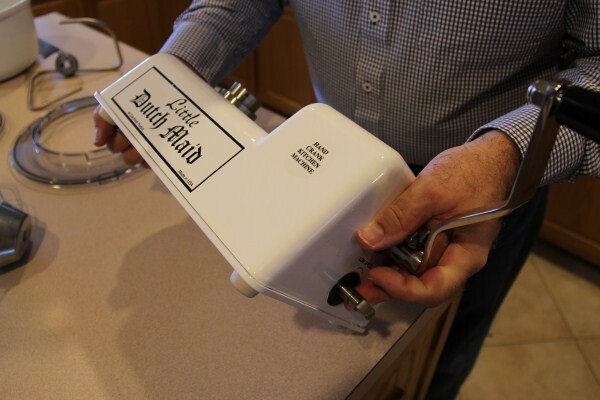 The Little Dutch Maid is the perfect off-grid hand crank kitchen mixer. It uses no electricity yet, a two-speed hand crank system will process large amounts of mixes quickly. 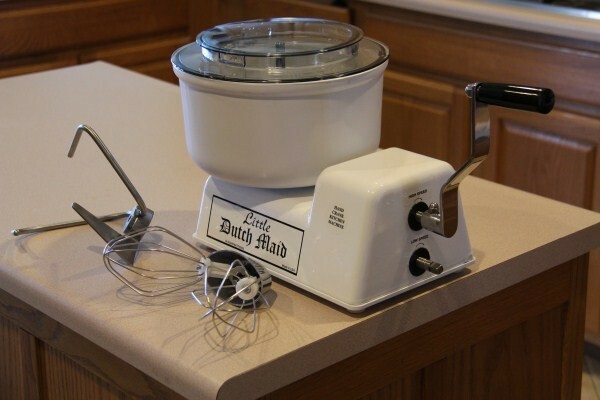 Everything that you would normally do with an electric countertop mixer including dough for bread can easily be done with The Little Dutch Maid. We take the unit one more step for customers who want to do more with it. We are the only company offering so many optional attachments to custom fit individual needs. Add the optional slicer and shredder options to make this unit a full functioning kitchen off the grid appliance. Two appliances in one! 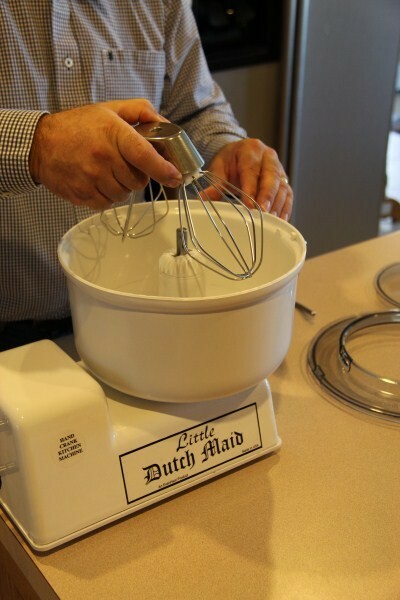 The Little Dutch Maid is a heavy-duty commercial grade, very easy-to-use hand crank mixer, for all your kitchen and cooking needs. The unit is perfect for summer camps, church camps, off-grid remote lifestyles, chuck wagon trail rides, emergency shelters, Dutch oven cook-off competitions, or any place where electricity is not available, limited wattage, or unpredictable. 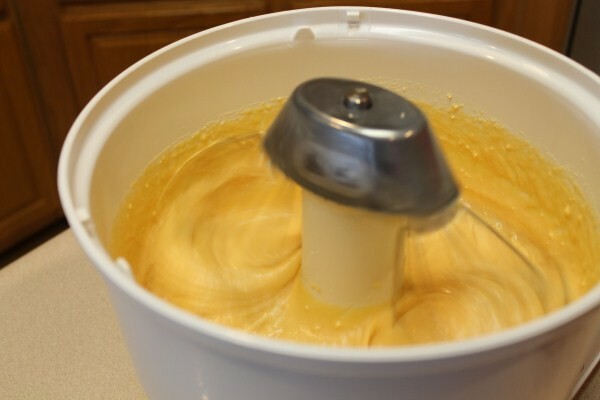 Electric mixers will tend to over mix the dough. 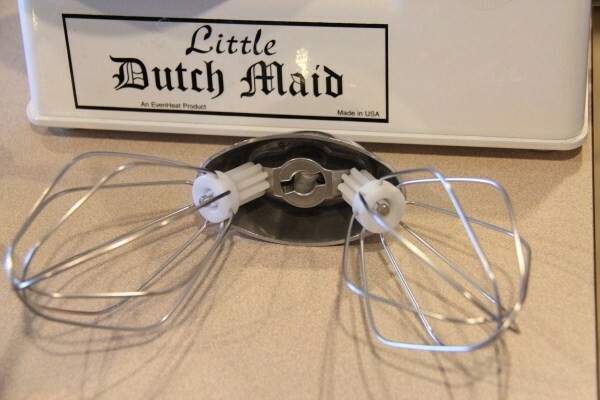 Those who have been using electric mixers soon discover they obtain better mixes using The Little Dutch Maid. You will be amazed how smoothly and easily this machine cranks; it is very easy to use, easy to clean up and will process large batches of dough and mashed potatoes with little fatigue to the arms and hands. There's no need to speed up the cranking for creams and sauces. 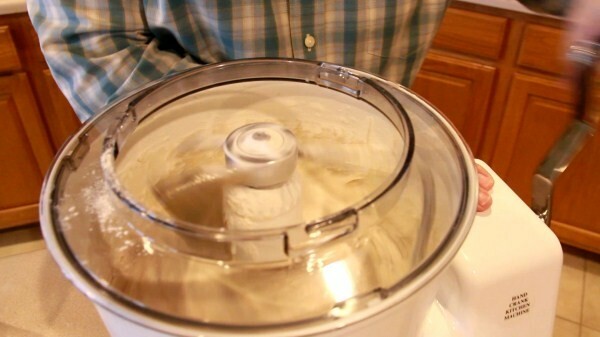 Just select between high speed or low speed to process dough and other foods like mashed potatoes, or select the high speed for whipped creams and sauces. Some have asked why does it cost so much? Being hand cranked without a motor should make it cheap to make, right? Once you lift The Little Dutch Mixer out of the box you will quickly appreciate the value this machine brings to the kitchen. It is far heavier built than any high-end domestic kitchen appliance built today. It will likely outlast any electric model as well. Just tap on the top of the base and you will experience the same solid sound as tapping on a large commercial Hobart® mixer. 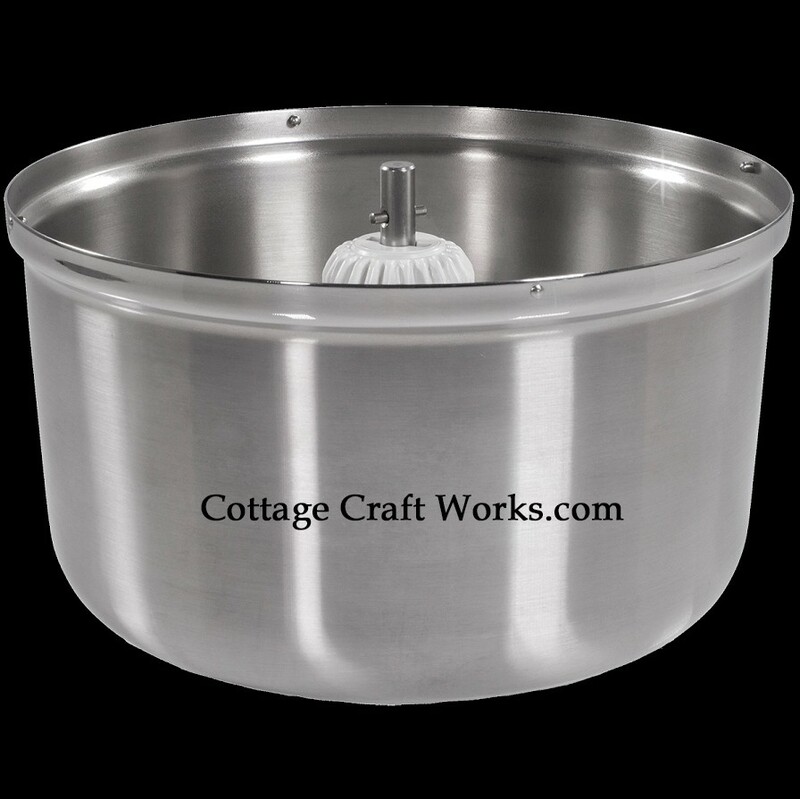 Cottage Craft Works has it priced well below the few who do carry this mixer online. This makes The Little Dutch Maid a solid investment for a lifetime and on to your next generation. We also provide the most optional equipment to go with it. The base part of this machine is built like a tank; it has a thick heavy base that is powder coated for many years of service. The weight of the mixer and the thick rubber feet keep it in place. There's no electric motor to ever wear out. The heavy-duty gears are made to hold up to hard and long use. No planned obsolescence here! The base measures 12-1/4" L x 8-1/4" W x 5-1/2" T. without the hand crank handle. You would only expect to see this type of heavy constructed appliance to be made in the 50s, not in this lifetime with so many thin metals and plastics to wear out. The fact is many of the mixers made in the 50s mechanically could still be used today, except the electrical brushes and armature have just worn out, or the wiring has become brittle and unsafe to use. Without an electric motor, the base part of the Little Dutch Maid Mixer is just that heavy duty to keep on going. The only part that may need to be replaced is the mixing bowl and attachments and even then the mixing bowl has removable replacement parts. Some do purchase an extra mixing bowl for competitive competitions and cook-offs so they can quickly change mixes without having to wash the bowls during a timed contest. 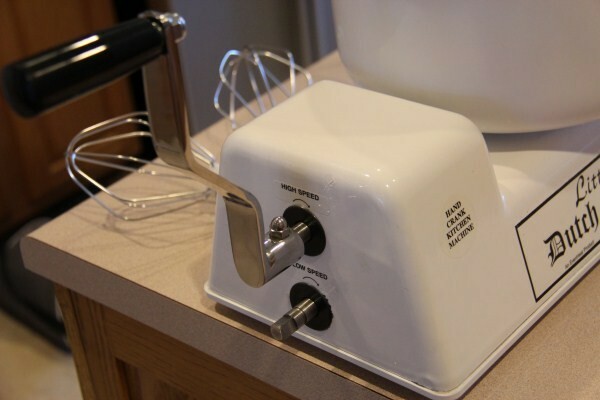 Although not necessary, the mixer may be upgraded with a stainless steel bowl using the drop down boxes. 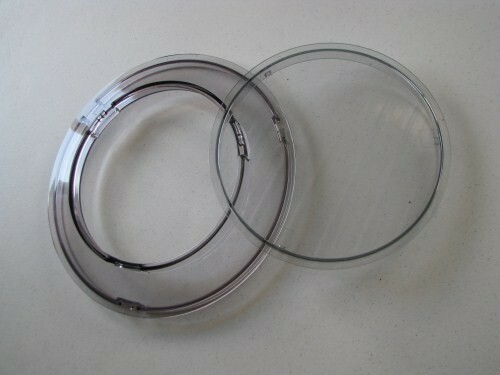 The standard plastic bowl is very heavy duty and will last a long time. Those who might consider the stainless bowl would be using the mixer more commercially or making ice cream where the bowl would need to be chilled. 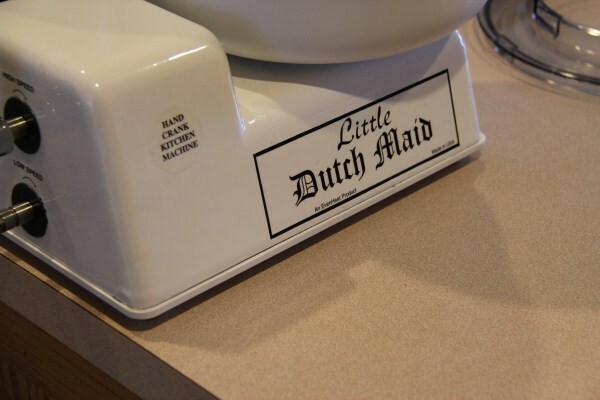 The Little Dutch Maid comes standard with a 4-qt heavy duty plastic bowl with a splash guard and cover. The bowl is made of flexible plastic that can bounce off the floor without cracking. The splash guard and cover are also made of high impact plastic. The bowl measures 10-1/2" at the top diameter x 6-3/4" tall with lid included. You will appreciate the ease of adding ingredients to the top of the mixing bowl. Because the unit drives from the bottom, there's no overhead motor assembly to work around when adding ingredients from a measuring a cup. The inner lid quickly removes to add the additional ingredients from the top while the splash guard can remain in place to keep liquids from splashing back out over the sides. 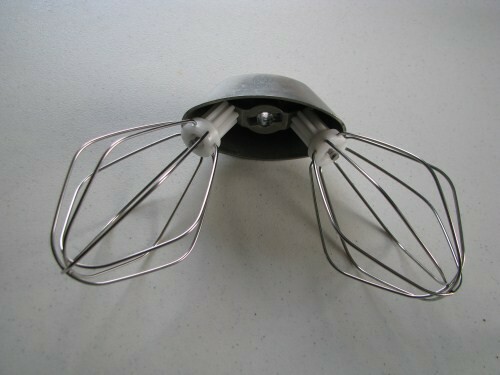 The unit also comes with a stainless steel accessory holder with twin beating whisks and a dough hook. 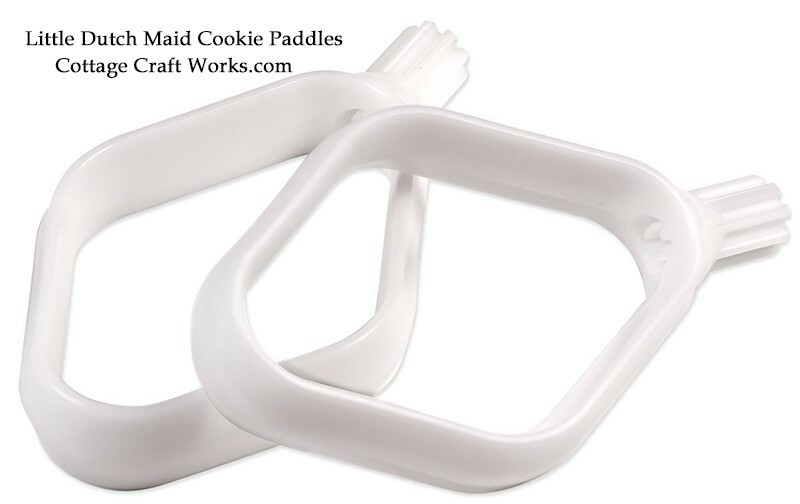 Optional cookie dough and cake paddles as pictured may also be purchased using the drop down boxes. They will fit in place of the beating whisks. The bowl and attachments are made by Bosh® one of the leading manufacturers of high-end mixers. These attachments are imported, the base is USA Made. The stainless steel bowl is an imported bowl and not from Bosh®. 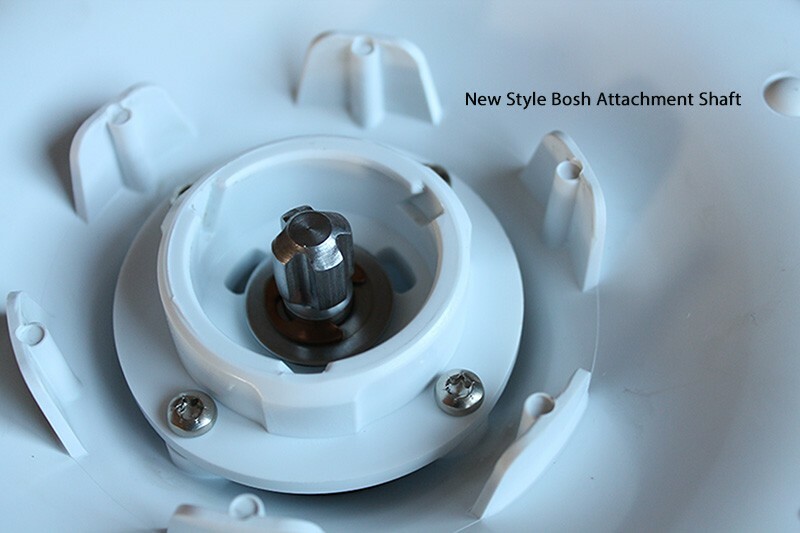 The Little Dutch Maid now features the newer Bosh + or star-shaped drive hub. The older Bosh attachments with the single straight slot hub reportedly will not fit the newer machines. 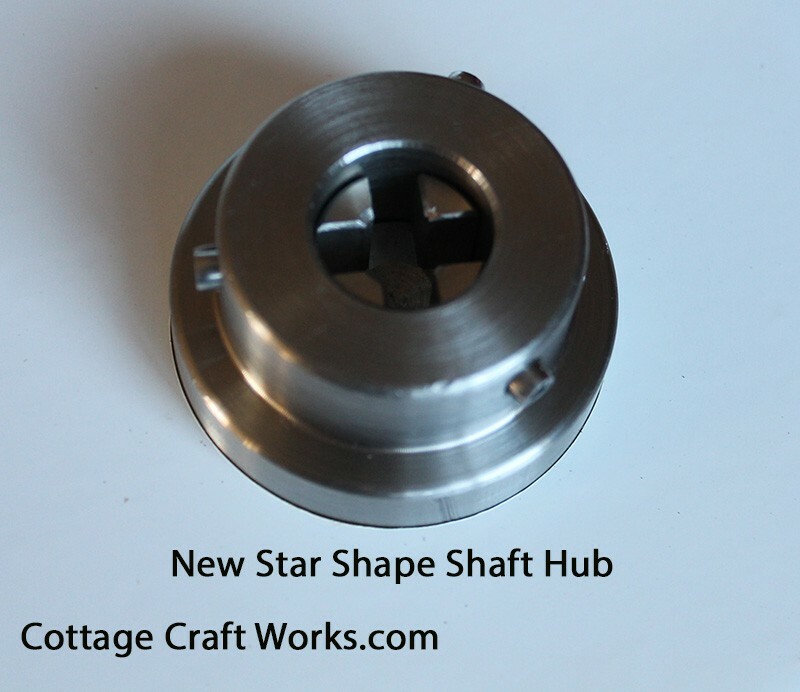 See pictures of the newer drive hub and the bowl shaft to compare to other attachments you may have. This is such a heavy duty quality built machine, it is doubtful you will need internal replacement parts, perhaps the mixing bowl and twin beaters at some point. However, if you do Cottage Craft Works can obtain any repair parts that you may need for the original TROYCRAFT or the Little Dutch Maid. As a factory direct dealer, we can also arrange for factory service and complete refurbishing should your processor ever becomes damaged. 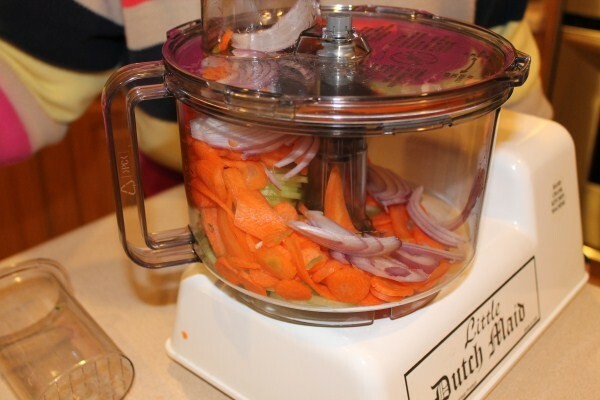 Add one of the two optional food chopper and shredders using the drop down boxes to make this a versatile food processor. The additional price will add to the mixer price when selected in the drop-down box. 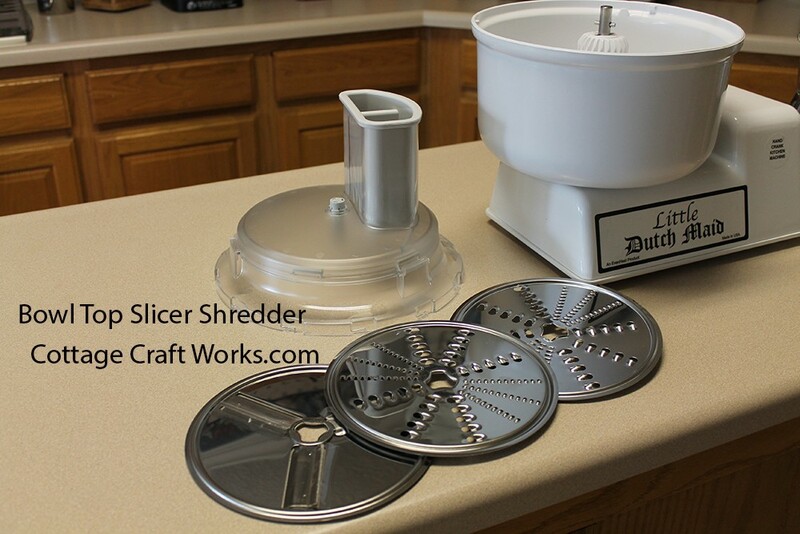 The self-contained slicer shredder fits the Hand-Crank Mixer. Featuring a 12 cup capacity high impact plastic bowl, just like the electric Universal Bosh® food processor. The Slicer Shredder comes standard with three top mount disks, for shredding/grating either coarse or fine, slicing thick/thin, and French fry. Blades reverse to provide two cutting options for thick or thin slices. This unit does not have a bottom chopping blade like a blender or food processor. 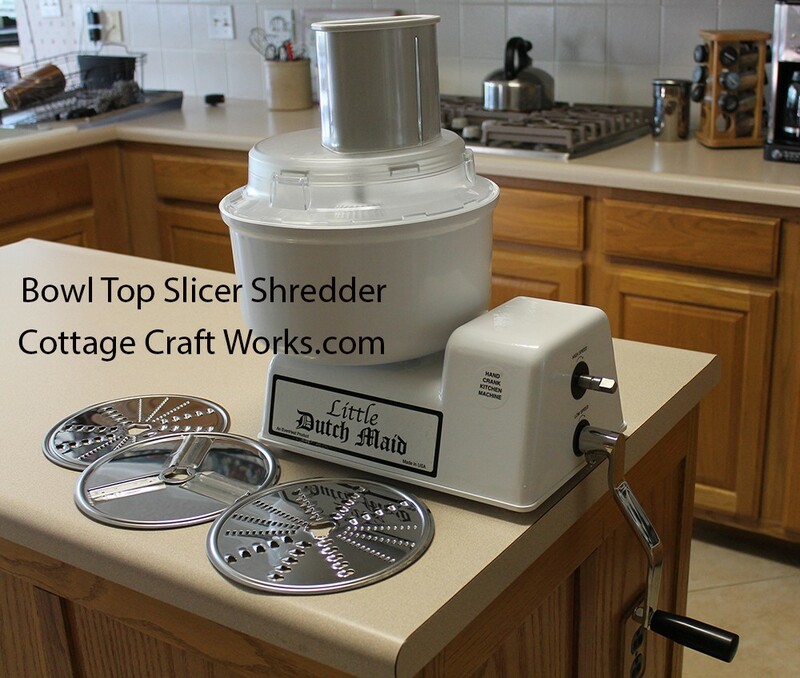 The bowl top slicer shredder option fits directly on the top of the standard plastic mixer bowl, not the stainless upgrade bowl. It also comes with the same three disks for shredding/grating and slicing. 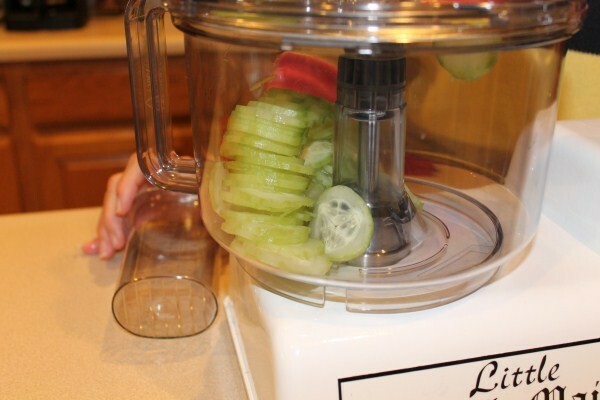 Neither of the slicer shredder units has a bottom chopping blade like a blender or food processor. You may add just an additional bowl or the bowl and lid with an extra dough hook and twin beating whisks (bowl with accessories). Both the plastic and stainless steel bowls are available using the drop down boxes. 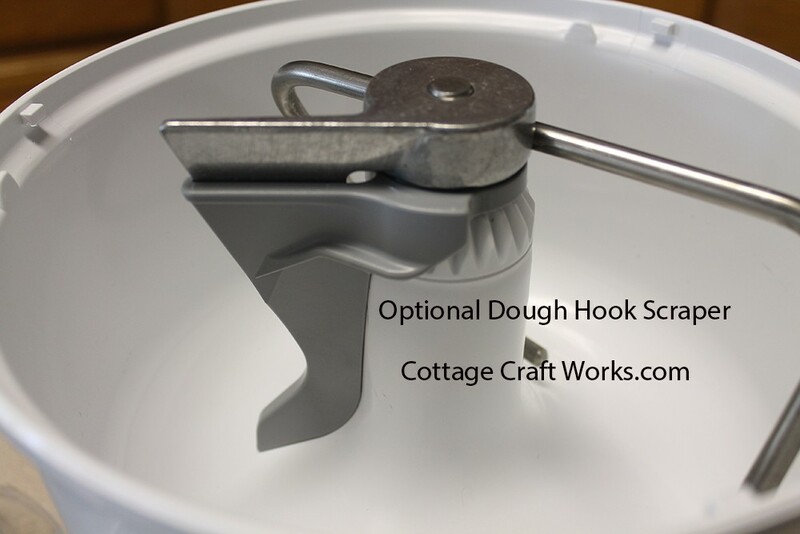 An optional dough hook scraper fits onto the dough hook to keep dough from sticking on center shaft bowl housing. Continental US UPS Ground will be your best shipping option. Alaska and Hawaii customers, USPS Priority Mail should display. For other areas considered part of the US please contact us as we may be able to ship to you USPS Priority Mail. Canada customers, your shipping should calculate UPS standard in the shipping calculator upon checkout. If not please drop us an e-mail. We do not ship to all countries and not all of our products ship outside of the US. Shipping may not show if you have other items in your cart. The Mixer arrived today in excellent condition. It is everything we hoped it would be and after two cakes and a batch of Pizza Dough we are very pleased with the performance. Thanks again for the help you gave us and the time you took to make this happen, it is greatly appreciated. Warmest regards from the UK. Just a quick update on the mixer. We have been using it now for a while and have found it to be far superior to any electric mixer we have ever owned. As a result we have used it far more than we would an electric one. 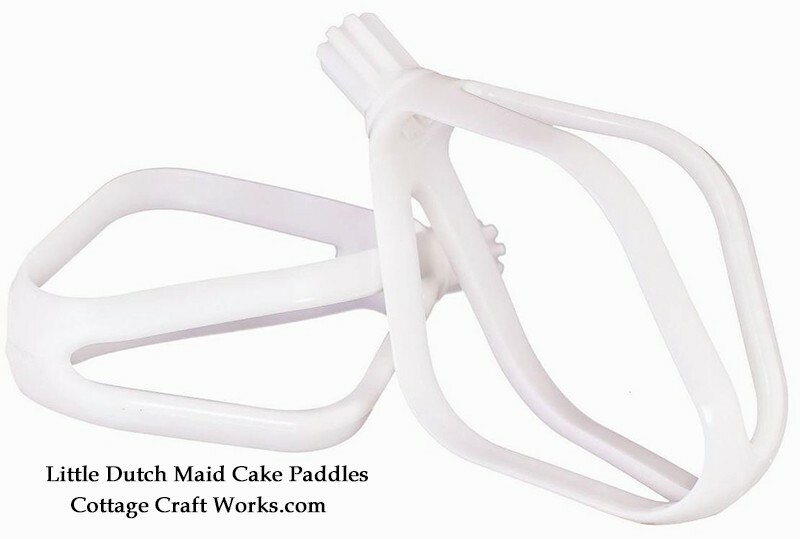 Even the children enjoy baking if they can use the Little Dutch Maid. I just thought you would appreciate knowing that the effort you put into the transaction is appreciated, and we have been telling our friends and family about you and the mixer. 5 stars on this product and worth every dollar! 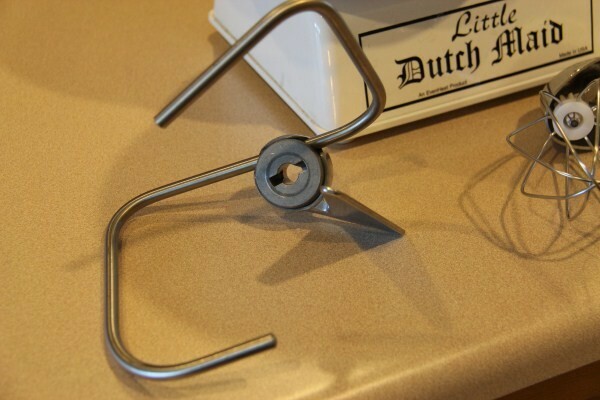 I recently ordered the Little Dutch Maid Off-Grid Hand Crank Mixer from Cottage Craftworks. First of all, I must say that their customer service is AMAZING. I honestly have never had a better experience buying anything online. It was like I had walked in to the store and was speaking to them in person. Prompt emails and even phone calls initiated by them to help me make my purchase and ship the product to me expeditiously. Thank you Paul and staff for everything. As for the mixer.....YEAH. I love it. Why didn't I invest in it sooner. And to think I was whisking things by hand for up to 15 minutes with piano whisk before when it now only takes maybe 5 minutes of easy turning of the handle. 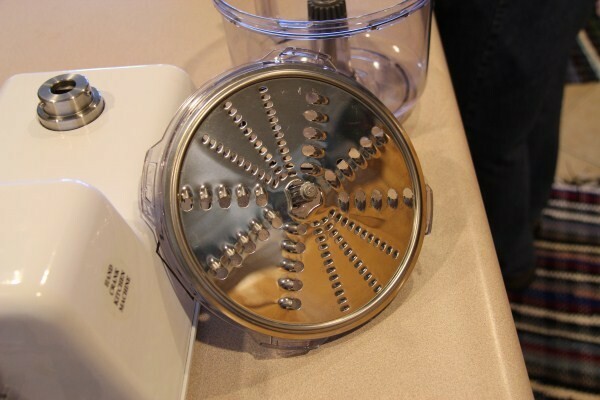 The mixer seems to be built well. It's base is heavy so you don't have to worry about it flipping off the table or moving on you. So far I have only used the whip but I can say it whips beautifully.